Kingswood is located on 30 acres in south Kansas City and, with the redesign, will continue to lift the senior living experience to new levels. The intent of these changes is to stay ahead of the expectations curve of our current and future residents and the increased demand for memory care and assisted living services. Kingswood Senior Living Community – a leader in the Continuing Care Retirement Community (CCRC) concept and one of the region’s premier senior living destinations -- today announced plans to break ground on a $34.7 million redesign and expansion project to meet the evolving needs of current and prospective residents. Kingswood has been rooted in the community for more than three decades providing the highest quality continuum of care. Kingswood is located on 30 acres in south Kansas City and, with the redesign, will continue to lift the senior living experience to new levels – expanding residential choices, promoting increased wellness and social engagement and improving physical and mental health services. From more assisted living residences to a new rooftop dining venue, Kingswood’s redesign promises comprehensive change while maintaining its inviting, neighborhood-like setting. Plans include a major overhaul of the Clubhouse, the hub of the Kingswood community. The main lobby will be completely refurbished and feature a grand entrance with an elegant staircase and a new elevator. This will be done by lowering the entire front entrance a full story to create a more accessible and inviting reception area. 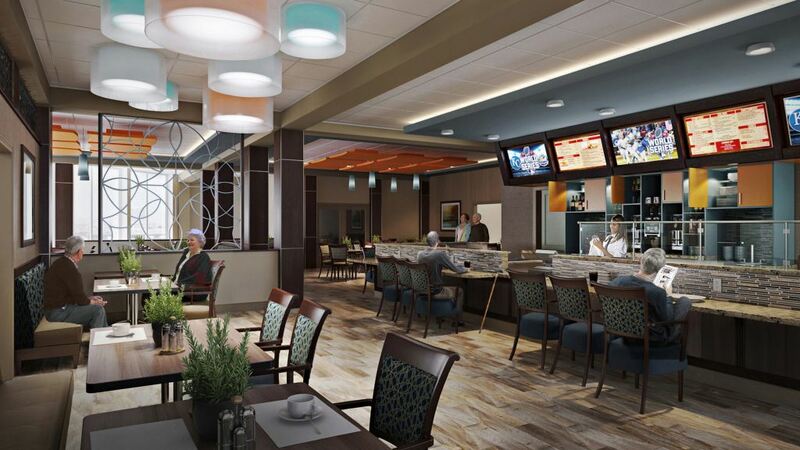 First-floor amenities will include a new bistro dining venue, convenience store and library. 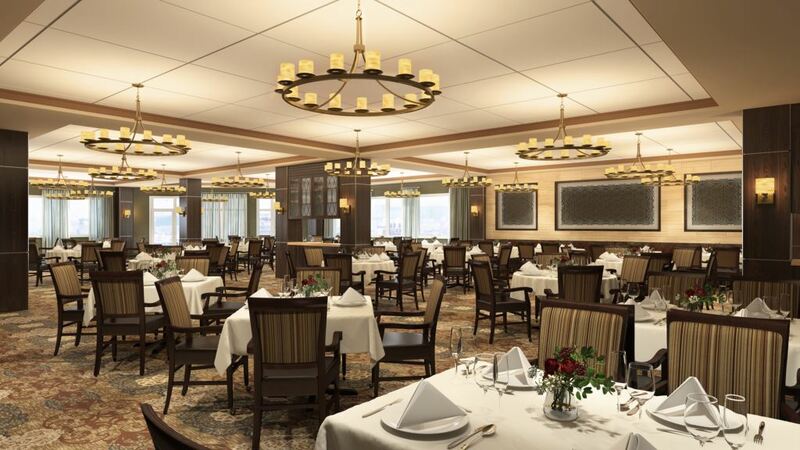 The second floor will be updated with new interior décor, accessibility improvements in dining areas and new rooftop terrace dining to enable residents to take meals overlooking the property. The second floor also will feature a new art studio, a movie theatre complete with silver screen and plush seating, and a state-of-the-art performing arts center. The new performing arts center, with its Steinway grand piano, is expected to remain a recurring recital stop for students from UMKC’s Conservatory of Music and Dance who have performed at Kingswood for years. One of four apartment buildings on the property will undergo a significant redesign to keep pace with new and future residents’ assisted-living and memory-care needs. Kingswood plans to convert 47 independent living apartments on three floors of the North building into 30 assisted living residences and 23 memory care suites. The conversion will feature new dining areas, activity rooms, a beauty salon and more common areas for residents to gather or greet outside guests. All will be designed to create a comfortable home-like feel. Construction completion of the North building redesign is expected in the fall of this year. 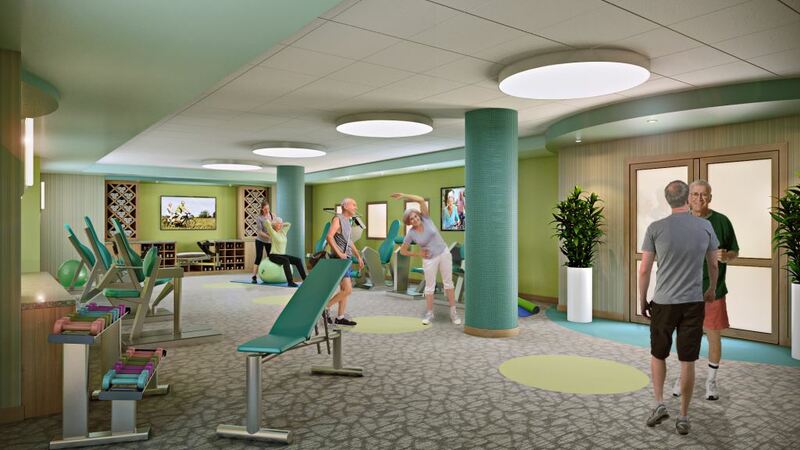 Moore added that residents’ health and fitness will rise as a priority at Kingswood with the addition of new and expanded offerings at the community’s Wellness Center. New suites will be added for physical therapy and occupational therapy, cardiovascular and strength training, group fitness activities, wellness classes and spa treatments. The spa will be part of a new high-end salon. The entrance to the community’s zero-entry swimming pool will be adapted for increased accessibility. Kingswood’s redesign plan, which has been in the works since 2012, also includes an on-site clinic that would serve as a future one-stop shop for residents’ medications and visits with nurse practitioners and doctors. Kingswood recently acquired land adjacent to the campus on which it will build 11 new 1,500- to 1,800- square foot villas, increasing the villa total to 65. The villas offer independent living in a quaint neighborhood of maintenance-free, single-dwelling and duplex homes consisting of two-bedroom floor plans with attached oversized two-car garages and spacious basements, which could be finished by residents to significantly increase their living space. Villa residents select their choice of cabinets, countertops, flooring, interior paint colors, and other interior finishes, and they can add porches and decks to fit their lifestyles. Pre-sales for the new villas begin this month. Independent living is also offered in apartment homes with over 20 different floor plans. Large studio, one- and two-bedroom style apartments are available. A new marketing suite, resident selections gallery, and furnished model apartment with state of the art finishes is also a part of the project. Kingswood’s location in the Kansas City area offers residents easy access to area sites and attractions. Situated blocks from the I-435 corridor near the Kansas state line, residents can travel effortlessly to and from Kansas and Missouri from the Kingswood community. Suburbs like Leawood, Overland Park, and Lee’s Summit are just minutes away. Trips south for dining and shopping at Town Centre Plaza are a short drive or bus ride; the same applies for trips north to the Country Club Plaza or downtown Kansas City. Kingswood is also strategically located close to some of the area’s finest hospitals and medical centers. Kingswood’s transportation services are a convenient way to access the greater Kansas City area from its superb location. Kingswood will celebrate its redesign and expansion with a groundbreaking ceremony and reception at 1:30 p.m. on Wednesday, Feb. 17, at 10000 Wornall Road in Kansas City, Mo. Expected to attend the celebration are local dignitaries, Kingswood Board Members and staff, representatives from its project team and representatives from its managing company, Life Care Services. The Kingswood redesign is a collaboration of industry experts led by LCS Development, a leader in senior living community development. The project team assembled by LCS Development includes Paric Construction, AG Architecture, AMAI Architecture, Spellman Brady and Company interior design and Cain Brothers. Cain Brothers has been a long term capital access consultant for Kingswood most recently leading the finance working group to assist Kingswood to close the financing for the redesign project on January 6, 2016. Many phases of the project will be completed in 2016, with the final project completion expected in April of 2017. Kingswood is a Continuing Care Retirement Community (CCRC) that inspires active living for those aged 65 or older. Located in Kansas City, Mo., near the Kansas state line, Kingswood provides services, programs and amenities within its residential living setting that promote independence and optimal health. Kingswood assures residents access to a full continuum of care on site, ranging from independent living and assisted living to its five-star rated skilled nursing care. Kingswood has a strong history of providing the best value and the best quality of senior living in the center of all Kansas City has to offer. LCS Development™, an LCS Company, is the only firm with a complete in-house team to support all aspects of your development or redevelopment project, which includes in-house licensed architects. This ensures three things: continuity, accountability, and certainty of execution – on time and on budget. Since 1971, LCS Development has successfully developed 45 new continuing care retirement communities (CCRCs). In addition, we have developed 12 repositioning projects just within the last five years. So we understand the importance of analyzing the market, understanding its parameters and knowing how future residents will shape your community’s design and build out. Established in 1971, Life Care Services, an LCS Company, is the nation’s leading manager of full-service senior living communities. Life Care Services currently provides operations, marketing and sales management services for not-for-profit and for-profit continuing care retirement communities (CCRCs) serving more than 23,000 residents daily at more than 80 communities in 31 states nationwide. The company operates five businesses focusing on Development, Operational Management, Home Health Care, Group Purchasing, and Ancillary Services. LCS is a privately held, employee-owned corporation based in Des Moines, Iowa. For more information, visit http://www.LCSnet.com and http://www.lifecareserviceslcs.com. First-floor amenities will include a new bistro dining venue, convenience store and library. New suites will be added for physical therapy and occupational therapy, cardiovascular and strength training, group fitness activities, wellness classes and spa treatments. The conversion will feature new dining areas, activity rooms, a beauty salon and more common areas for residents to gather or greet outside guests. Kingswood Senior Living Community assures residents access to a full continuum of care on site, ranging from independent living and assisted living to its five-star rated skilled nursing care.